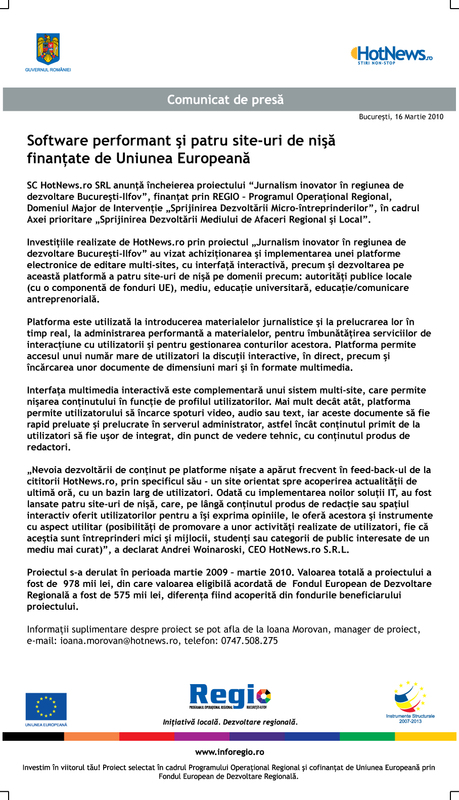 HotNews.ro is one of the most read news websites in Romania due to a closely knit group of passionate journalists who have been working together for years, but also due to its readers: an informed public informed in quickly delivered, relevant news, people who stood by us and oftentimes was critical of us, forcing us to always keep high standards. The former editor-in-chief, Cristian Pantazi, and former cordinating editor Dan Tapalaga, two of the journalists who left their mark in the development of the website for more than a decade, have launched a separate journalism project. We wish them success. We remain the same dedicated team of journalists who for all these years paid efforts to serve the public interest with the information we publish. Cristian Pantazi and Dan Tapalaga are the only ones to leave the HotNews.ro newsroom. The rest of the team stays and the coordination of the website will stay with an editorial council formed of journalists from inside the newsroom. They are colleagues who have been working together for more than a decade. The members of the team can be found in the team section of the website and here (second part of article in Romanian). HotNews.ro will keep publishing news and analyses of relevance and cover a wide range of issues professionally. From domestic and international current events to economy, education, health, energy and transports. From stories and reports from street protests to news about local administration, government, ministries. From sports news to politics and justice. We will continue to try our best to serve the public interest and deliver relevant news in a fair, quick, constant manner. There will be times when we might be wrong, but we hope that you, our public, will be by our side, always vigilant and critical.